Day 27: So Close – The San Francisco Bay Trail: It's Closer Than You Think! Today’s hike through Oyster Point in South San Francisco and Sierra Point in Brisbane was a return to one of my favorite “secret” spots along our shoreline. Yet the ingredient that made it to that short list was mist, rain and fog. The main image on my blog of a long wooden pier was taken here several years ago when I was still working with medium format film and, after yesterday’s rain, I thought history might repeat itself. It was not to be – today’s bright sunshine, dramatic cloudscapes and east coast style humidity was a far cry from the light rain and early morning mist of my first encounter. However it was just as beautiful nonetheless. A few seagulls dotted the sands at low tide, however birds of the supersonic man-made kind must keep all the others at bay as they roar into the jet-stream from SFO just a few miles south. 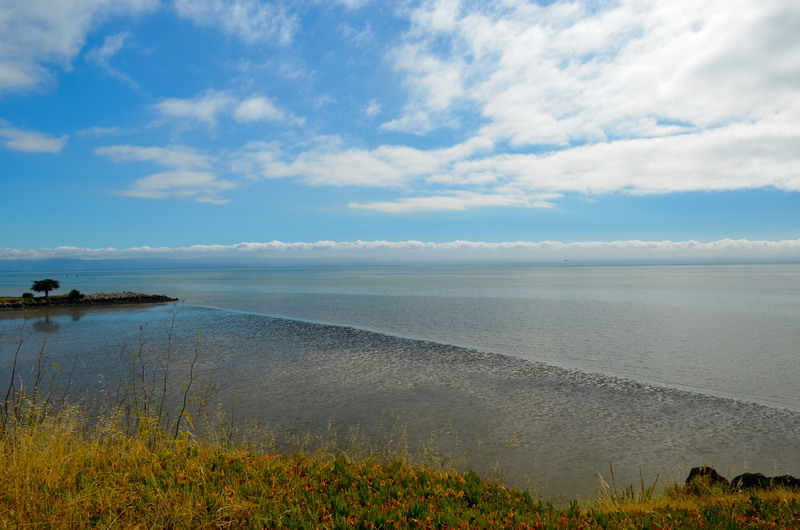 The Bay Trail hugs the entire shoreline of this section and includes one hundred eighty degree vistas from the South Bay to San Francisco. It was humbling to look north, south and east and take in the views of these vastly different shorelines that I have trekked my way through over the past four weeks. I am not sure how I will feel when it comes to a finale at the Ferry Building this Saturday, but I know I will be planning to return to many of the Bay Trail towns I wish I had spent more time in during my walk. Mountain View has its red, yellow and green Google bikes. South San Francisco has its green Genentech bikes. Not green in the literal sense. They are actually grey, hybrid electric bikes available for check out by employees at various bike racks throughout their campuses in South San Francisco. With a couple of gradual hills I am sure some of the employees enjoy the option of going to electric motor mode from time to time. What I noticed most of all down here, besides the views, modern mid-rise office complexes, and warm weather was the impeccable condition of the trail. For the most part it is paved and bordered by carefully tended landscaping. Barbeque grills are interspersed along the trail around San Bruno Point and picnic tables and benches provide ample spaces to relax. I came across a classic scene by the Oyster Cove Marina of a man resting on the grass in some shade with two of his three white poodles running amok and enjoying themselves. Where was the third? It was stretched out under the man’s head. Yes, he was using his dog as a pillow. I tried this with Oscar Wilde this evening and it lasted about three seconds. He made a grunt, squirmed a little and pulled away to the comfort of his own pillow, obviously not wanting any part of serving as my headrest.